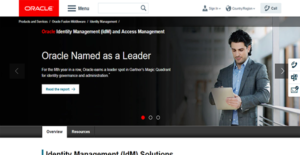 Oracle Identity Management is a complete suite of cloud-based identity management solutions. This next-generation platform comprises identity governance, access management, and directory solution that modernizes and scales identity management. With Oracle Identity Management’s four components, you can secure your organization’s sensitive application and confidential data whether they on-premises or in the cloud. Aside from that, the software suite enables you to ensure rapid compliance with standards while you cut down operational costs. Moreover, Oracle Identity Management is well suited to the cloud, thus allowing you to utilize it for mobile and social ecosystems. As such, you can expect advanced performance for vital organizational projects and functions. Oracle Identity Management is a cloud-native suite of identity and security governance solutions. A comprehensive platform, it gives you hybrid identity features to help you provide and manage single user identities for members of your organization. They can then utilize these identities throughout the company’s on-premises and cloud-based services for a seamless user experience. Oracle Identity Management gives you the tools to configure access, security, and compliance across the organization’s network. The suite’s access management solution is adaptive, in that you can extend your security processes from your premises to the cloud and mobile environments. On top of that, it enables your customers to configure their own cloud-based single sign-on service. Oracle Identity Management has a low total cost of ownership for organizations who want to centralize and simplify their identity governance processes. It does that by enabling end users access to a self-service interface that promotes productivity and paves the way for greater operational efficiency. Oracle Identity Management offers you a unified solution for directory services. It has storage, proxy, synchronization, and virtualization abilities that gives you access to the services that are critical high-performance enterprise processes. Additionally, it lets you scale out with ease with its elastic deployment. If you are interested in Oracle Identity Management it could also be beneficial to examine other subcategories of Best Identity Management Software gathered in our base of SaaS software reviews. Since each company has particular business wants, it is prudent for them to abstain from seeking a one-size-fits-all perfect software solution. Needless to say, it would be pointless to try to find such a platform even among market-leading software platforms. The intelligent thing to do would be to jot down the various important aspects that require consideration such as main features, finances, skill levels of workers, company size etc. Then, you should do your homework thoroughly. Read some Oracle Identity Management reviews and look into each of the other solutions in your shortlist in detail. Such exhaustive groundwork can ensure you reject ill-fitting platforms and choose the system that provides all the elements you need for business success. How Much Does Oracle Identity Management Cost? We realize that when you make a decision to buy Identity Management Software it’s important not only to see how experts evaluate it in their reviews, but also to find out if the real people and companies that buy it are actually satisfied with the product. That’s why we’ve created our behavior-based Customer Satisfaction Algorithm™ that gathers customer reviews, comments and Oracle Identity Management reviews across a wide range of social media sites. The data is then presented in an easy to digest form showing how many people had positive and negative experience with Oracle Identity Management. With that information at hand you should be equipped to make an informed buying decision that you won’t regret. What are Oracle Identity Management pricing details? What integrations are available for Oracle Identity Management?